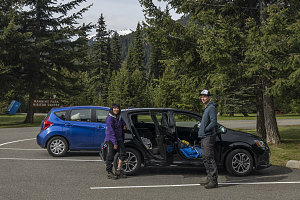 The final phase of my June 2016 "northwest" trip consisted of a few days with Kyle - Arn's brother - in and around Vancouver (the first phase had been with Rosty in the Seattle area, trying to climb Glacier Peak). We planned to do a weekend backpack before I caught my plane back to Ottawa late Sunday night. 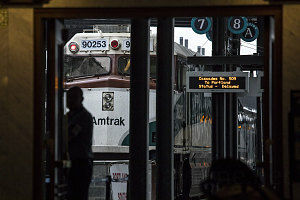 To get from Seattle to Vancouver, I chose to take a mode of transportation I've become more fond of recently: the train. The pricing was very agreeable, too, with a business-class seat going for only $75. Business class doesn't get you too much more than a nicer seat and more space, but still - $75! I left Seattle on a Thursday, in (what a surprise) pouring rain. The ride was quite pleasant, with some surprisingly scenic sections along Puget Sound and probably also good views of Mt Baker (which I didn't see because of clouds). 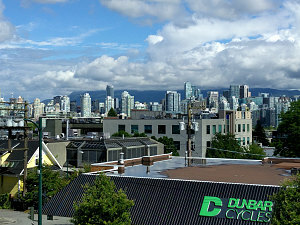 The train didn't stop at the border but rather continued straight on to Vancouver, where customs are handled. 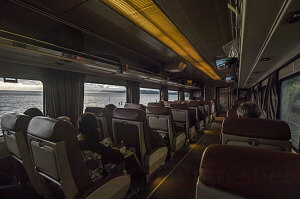 The last little bit into downtown Vancouver was excruciatingly slow, inching over the Fraser river and then winding very slowly - sometimes stopped - towards Pacific Central Station, The reason for this? Apparently the train had to stop in three separate locations for a conductor to get out and physically switch track sections. What!? This wasn't a 3rd-world country in the 1930s. What gives? Due to this slowness, the train arrived about 40 minutes late in Vancouver, and Kyle said he'd pick me up and drive me back to his place. In a bit of a rush to get off the train and not keep him waiting, I didn't really notice that I had gotten on the train in my outer shell wind/rain jacket, but I was now getting off the train without it. It was only after being 45 minutes asleep at Kyle's place that I sat bolt upright and realized - I wasn't wearing my coat [when I disembarked], and I didn't pack it away at any time either. Sure enough, a quick look around my room revealed that I didn't have my jacket. It was still on the train. Thus began a multi-day attempt to get it back. I immediately called Amtrak and Via Rail Canada, went back to the train station, called again, got on callback lists (for which Amtrak never called me back), and ultimately never got my jacket back. It was possible that someone had actually taken my jacket with them at one of the stops along the way. Anyway, a complete drag. A decent $75 train ticket had now effectly cost me $400. Fortunately, Kyle had a spare jacket to lend me for our outing. 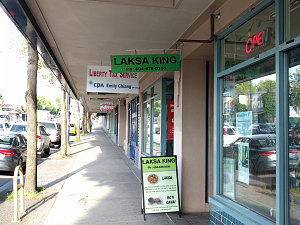 I spent a pleasant Friday wandering around Vancouver - stopping at Mountain Equipment Co-op for some supplies, visiting Kyle at his new office on Cambie Street in downtown Vancouver, and sampling several tasty eating establishments. 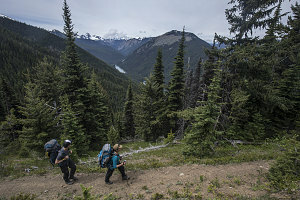 Our plan had been to do a two-day backpack of the Howe Sound Crest Trail - an interesting traverse along the crest of the coastal mountains roughly between the town of Squamish and North Vancouver. However, based on the snow conditions I had encountered thus far on this trip, I was hesistant. Putting us further beyond the hesitant column was the weather - it was not looking that great; at best we'd probably be in whiteout clouds, at worst it might be pouring rain as well. So..... no. Was not going to go through that again, and it was time to re-vector. I did some looking at forecasts further inland, which by virtue of mountain rain-shadow effects often have better forecasts, and came up with Manning Provincial Park as a decent alternative location. 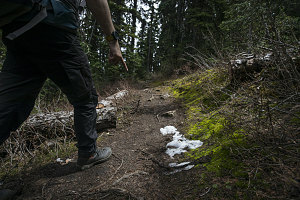 We chose something called the Frosty Mountain Loop in Manning Provincial Park. 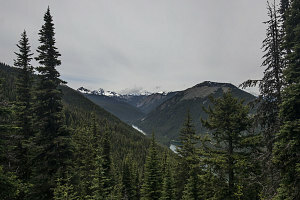 Roughly 30km in distance, it was - like the Howe Sound Crest Trail - easily doable in two days. 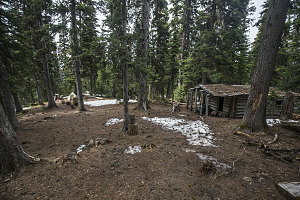 It apparently provided access to quite a nice, very scenic location: the top of Frosty Mountain, the highest peak in Manning Park, at nearly 8000 feet in elevation. The forecast was not perfect but decent. 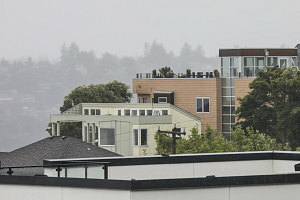 It appeared to show partly cloudy conditions for both days. Sold. 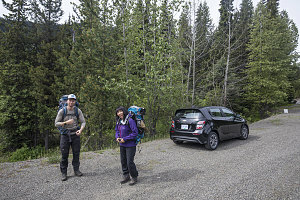 After driving from Vancouver to Manning and obtaining our backcountry permits from the park office, we positioned our car at the northern tip of the Pacific Crest Trail. 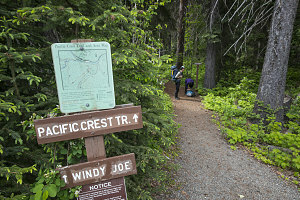 The PCT is the famous, wildly scenic 4200+km (2600+ mile) long distance trail that stretches from Mexico to Canada. 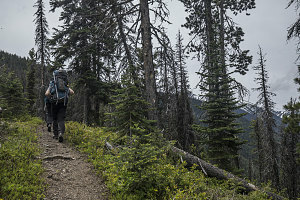 After saddling up, we began walking west, not on the PCT but on a wide multi-use path (I think it's called the South Gibsons Trail) that paralleled one of the park roads. 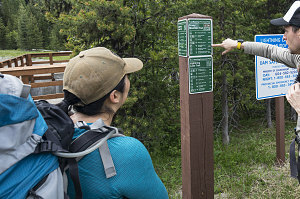 This was just a way to get us over to the western end of the Frosty Mountain trail, which is not itself a complete loop but more of a horseshoe-shaped sort of affair. 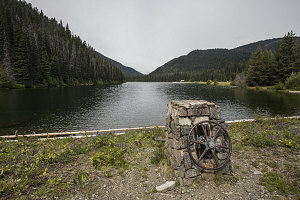 Less than an hour's walk brought us to the Lightning Lake Area - one of the parks frontcountry recreational zones with a car campground and various activites such as boat rentals. From here a veritable stack of detailed trail signage directed us to the start of the Frosty Mountain Trail. 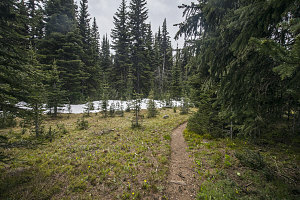 From Lightning Lake, the Frosty Mountain trail led up in very well-constructed switchbacks. 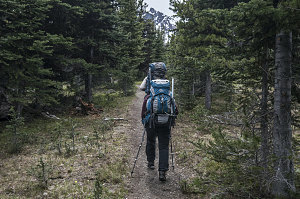 This soft, uneroded and well-graded trail hands out what is probably the least strenuous way to gain 2000 feet of elevation, up to a flat plateau-like area south of Frosty Mountain. Very nice. There were only a few lookouts to the west, but what we saw was nice. Weather was decent, too - a thin overcast existed, but it didn't obscure views nor did it impede the warmth of the sun all that much. Fingers crossed for a continuation of this tomorrow, when we'd be up in the alpine with the really good views. After all of the snow I'd encountered over the past week, I was curious as to when the snowpack would start. 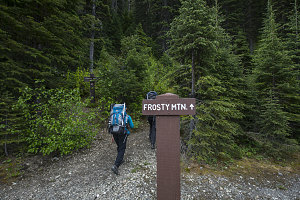 I was hoping that it was beyond our intended campsite - a spot known as Frosty Mountain Camp. We'd rather set up on dry ground than on snow. 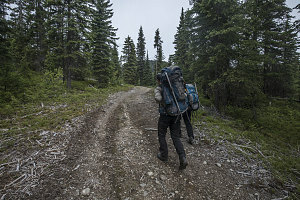 As we crossed the high forested plateau toward the camp, we did start to encounter snow patches, but fortunately, they weren't continuous, and the camp itself turned out to have more bare ground than snow. 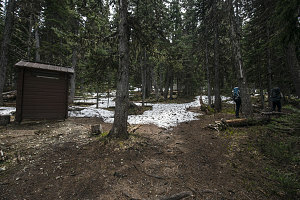 Here a little ways into the interior, the snow line was definitely higher than it had been in the Seattle / Vancouver areas - probably by roughly 1000 feet. We had made good time, and we had our camp set up by 2:30pm or so. To amuse ourselves for the rest of the afternoon (and because Hyndmans can't help but do otherwise), we set about making a campfire. 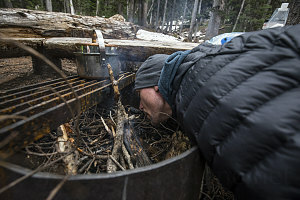 The recently melted terrain around camp meant that everything was rather damp, and Kyle had great difficulty with the fire. After many lighting attempts (including using some mysterious fire-starter sticks that Mauree had brought), we resorted to continous blowing (well, rather Mauree and Kyle - I actually did very little of it). For what was literally hours, Kyle and Mauree carefully blew on the nascent fire. Mostly we generated smoke - lots of smoke - and little heat. Finally, by about... oh, 7pm, the thing finally was good on its own, and it started to produce some reasonable heat. But... was that actually all worth it?